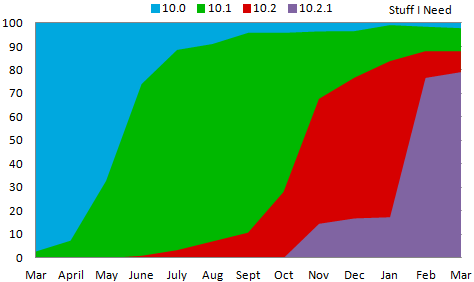 March saw more users continue to adopt OS 10.2.1 which now accounts for 73.7% of Pixelated users and 79.2% of Stuff I Need users. 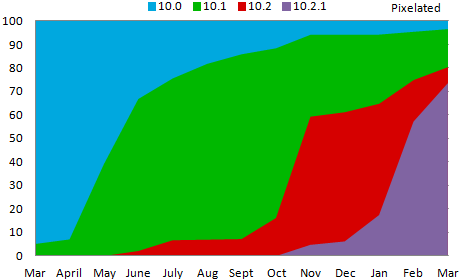 Despite these increases, a disturbing number of users continue to run OS 10.1 which is proving slow to go away. At least part of the blame for this falls on AT&T which has not yet approved any of the 10.2.x updates. The user base continues to be dominated by the BlackBerry Z10 which accounts for the majority of the market at 59.2% of all devices. This data was collected by BlackBerry World for downloads of the free strategy game Pixelated and the free checklist app Stuff I Need. Data shown on the chart is from the beginning of March 2013 through the end of March 2014.